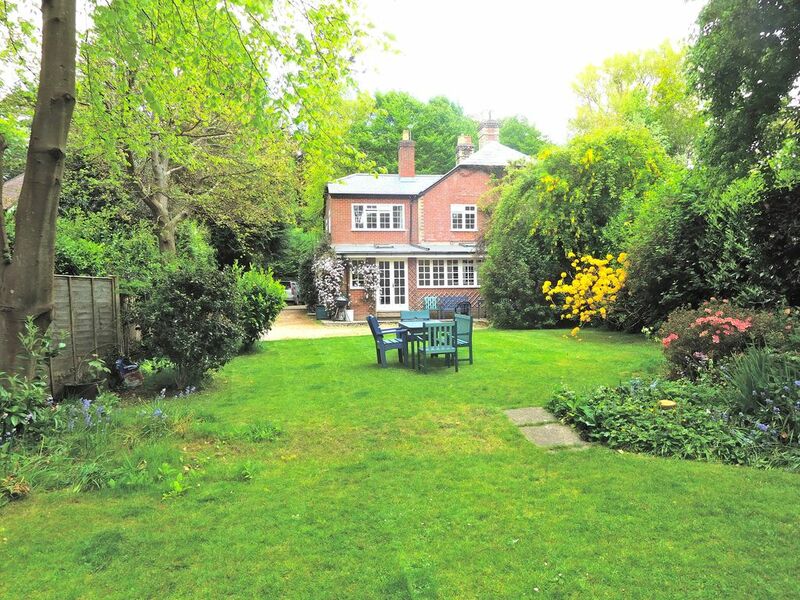 4 bedroom Cottage in large private garden off single track lane. Cottage near Brockenhurst, New Forest, Quiet Location; The perfect base for a New Forest holiday or family meet up. The cottage was originally built as a gardeners cottage for the Shackleton estate. It has been sympathetically extended and now has 4 bedrooms, 2 sitting rooms, a large dining room with wood burner and a kitchen with breakfast room attached. There is an open log fire in the Snug and a 42" LED TV making it perfect retreat for those cooler evenings. The lower sitting room has a TV as well so clashes of viewing can be avoided! There is ample parking for 3+ cars. The garden has lots of interesting areas of trees and shrubs as well as 4 areas of lawn to play on and it is well fenced so is safe for children and animals. Being about equidistant between Lymington and Brockenhurst 1 Hurstly Cottage is superbly located for shops, restaurants and there are good local pubs. It is near the sea and minutes from the heart of the New Forest for walks or cycle rides making it the ideal place to base for your holiday as you have the best of everything. We bought the cottage because of its lovely gardens and we could see the potential that the cottage held. Our criteria was to be in the New Forest, on a quiet lane yet near Lymington and the sea and within walking distance of a good pub; There are three! Also, to be able to walk the dog without having to get in the car. Royden Woods fulfil this beautifully. Access to public transport; bus and end of the lane and rail service to London from Brockenhurst also were of importance to us. This cottage is a hidden gem. It is loved by all who visit and we have one family who have come to 1 Hurstly Cottage for the last 9 years for Easter and have already booked for next year. In the summer the garden is large enough to really have a feeling of space and privacy and in the winter months the inside of cottage is large enough to spread out when the weather is not so kind. During the Spring the garden is carpeted with Snowdrops and Daffs. Azaleas and Camelia bushes create a fantastic backdrop of colour. The accommodation is wonderfully flexible and having the 2 sitting rooms is wonderful for escaping from the children! The dining room is large enough for big family gatherings and the kitchen/breakfast room large enough for all ones needs. 2 Bathrooms, Upstairs: 1 bath, separate shower, handbasin and WC, hairdryer. Downstairs: Shower, handbasin and WC. Not very quick as the cottage is rural. 1 set per person per week. The Snug has 2 sofas and an open log fire, 42" LCD TV. DVD and Video players and a good library of films. Lower sitting room with 3 large sofas & a TV and DVD. Stereo. The lower Garden room has 3 sofas and a smaller TV and DVD player. If you do not get on with the Aga there is a normal gas cooker and hob too. Aga + normal gas cooker with oven grill and hob, dishwasher, fridge, freezer, Butlers sink, microwave, electric kettle, toaster. 2 kitchen tables. The Dinning Room has a lovely large wooden table that seats 6 and with the extra leaves it will happily seat 12. It is next to the kitchen. There is a Wood burning stove in this room for added warmth. There is a good selection of books on the shelves around the cottage. Selection of board games and puzzles plus the usual favourites like Back Gammon and Chess. Large garden with different spaces, runs about 100m down to the lane. Elmers Court has a tennis court. Notes on accommodation: The cottage is fitted out to a very high standard and is a real home from home. Bedrooms 1 & 2 are south facing and look down the garden. Bedroom 3 and 4 have a woodland view. There are 2 sitting rooms both with TV's and the Snug has a log fire. This is a big cottage with lots of space to spread out and relax. Outside: Large garden, a patio with teak funiture. BBQ. Utility Room: Washing machine, tumble dryer, drying rack, iron and ironing board. Outside at the rear there is a washing line. Cleaning / Towels / Linen / Maid service: All bed linen is cotton and the beds are made up prior to your arrival. Bath towels, hand towels & flannels & t-towels are provided. If staying for more than 1 week sheets and towels will be changed on Friday and the cottage cleaned. Other: Hall and boot room by back door. This property has got to be the best kept secret of the New Forest. So well equipped, beautiful property and beautiful grounds and surrounding. A truly sincere helpful host of which nothing was too much trouble. Would highly recommend. This is the second time my friends and I booked this wonderful house as we couldn't get enough of it last time! It is situated on a little country lane. The bedrooms are spacious and comfortable, the bathrooms very clean and modern. We particularly loved the two lounges and the fireplace and wood burner. The kitchen is kept warm by a cosy aga. The ideal country retreat for a glorious time of hiking, cooking, petting ponies and reading the papers. We really appreciate the vast collection of books and videos. There is plenty of space for at least four cars. This house just has it all, and the owner is very friendly and welcoming. Highly recommended! Wonderful cottage in excellent location with very helpful owners. Great location, very well equipped property, perfect location for walks (thank you Sandy for the suggestions and outline directions) and local pubs. Andy was really helpful in the lead up to the weekend. Very accommodating about our arrival time. Lovely to be able to seat everyone comfortably around the dining table. it was handy to have friends with us who were 'Aga users' though there is the alternative standard cooker. What a lovely cottage in a perfect location, seven of us stayed for a long weekend in May, We were greeted by a spotless well equipped cottage with very comfy beds. The owner had left us some lovely flowers and a bottle of wine. He called later to see that everything was ok and to welcome us. The cottage is well positioned to explore the surrounding area, we visited Beaulieu village, Bucklers Hard and Lymington which were all lovely. On Sunday we had lunch at the Hobler Inn, the food was fantastic and the staff couldn't have been nicer. A big thank you to Andy the cottage owner who was very helpful from our first inquiry through to our arrival, we would definitely recommend. Ruth, Sarah, Sue, Sally, Christina, Chris and Claire. Excellent place to cycle from with easy access to the network of lanes without going on a main road. 5 miles to Milford beach. This is shingle and looks out toward the Needles on the Isle of Wight. Lymington River is approx 1/2 mile from the sea and has important marsh lands around it to the west where many species of birds mass for breeding and migration. 8 miles to High cliff beach. Sandy beach and also looks across at the Needles. 18 miles to Bournemouth beach. Busy, sandy beach of international renown. Trains: Brockenhurst station, 1 1/2 miles. Mainline station to London Waterloo from Brockenhurst in under 1.5 hours. Electric cars for hire in Brockenhurst and bike hire. There are good local shops in Brockenhurst High Street with a butcher, green grocer, bakery and small supermarkets and a bank and superb ironmonger. There is a local farm shop about a mile away selling meat, pies and other home-made produce. 3 good pubs within walking distance all serving great food. The Hobbler: 600 yds. The Red Lion at Boldre: 1 mile down the quiet lane and bring a torch as there are no street lights. Lymington has an excellent market on Saturday morning and everything you'd expect to find in a bustling market town, port and yachting centre. Booking Notes: To book email or telephone Andy and Maggie. Booking procedure is simple and can all be done by email or post. Deposit of 50% usually required and full payment 2 months prior to start date. This is a pet friendly cottage and they are welcome and there is a nominal fee of £20 per head per week. Changeover Day: We run our weeks Friday-Friday and in high season this is not changeable. We can be more flexible at less busy times of year. Notes on prices: Prices start at £950 a week for the winter months rises to £1795 for the peak weeks and varies between the two for the Spring, early summer and autumn weeks. Summer 1/2 term is a peak week. Email me for a quote. Weekends are charged at 70% of the weekly rate for 2 or 3 nights and 4 nights at 80%.